From slicing through wood workpieces to ceramic tiles and a whole lot of other materials, a jigsaw is a versatile power tool and is a must-have for both DIY enthusiasts and professionals alike. Jigsaws are lightweight, agile and more portable than circular saws, and they use a small vertical blade that moves up and down at speeds of up to 3,000 strokes per minute. Different Jigsaws come with different features and it’s important to take a moment to think about how you will be using your saw before choosing a particular model. When analyzing your requirements, you need to be very honest. Ask yourself what are the main applications you will use your saw for and how often you will be using it. If you’re going to purchase a single unit, you will have to choose between corded and cordless models, and each has its own pros and cons. For instance, corded jigsaws come with more power, but cordless models tend to be more convenient especially in hard-to-reach places. So a corded jigsaw will be more appropriate if you’re going to be working with tough materials or if you will be using your jigsaw more frequently. But if you need a little more portability and flexibility, or when working in remote locations without access to grid electricity, then you should stick with the cordless models. Something else you should consider when choosing a jigsaw is power and speed. The more powerful your jigsaw is, the faster you will be able to work. To check the Jigsaw’s power, look at the voltage on cordless models and wattage on corded ones. A number of jigsaw models come with more than one speed setting, but a single speed is usually enough for most basic tasks. However, you may find models with variable speeds handy especially if you’re going to be working with different types of materials. So what are the best Jigsaws this 2018 you ask? There’re many other factors to consider when choosing the best jigsaw and things can get a little confusing especially with hundreds of models in the market all promising to offer cutting-edge performance. We understand you might not have extensive experience working with different jigsaws, and even with experience, the research and legwork involved in shopping for the best jigsaw that will actually offer value for money can be quite overwhelming. With that in mind, we decided to go out on a jigsaw shopping venture with the aim of identifying the best brands and models in the market, and help you narrow down to top 8 best units for your ease of choosing. As you might already know by now, we go all out by all means to research for the best products that will offer value for money to our readers. We don’t recommend products to our readers unless they are well researched, extensively reviewed and ruthlessly vetted to meet the industry’s highest standards with reference to quality, reliability, affordability (value for money) and durability. So what exactly did we consider when coming up this reviews and recommendations? Well, for this particular list of our top 8 jigsaw recommendations, here are the main functionalities, factors, and considerations that influenced our top picks. We considered jigsaw models across various price ranges and capabilities, from the low end, mid-range to high-end options. You will find some affordable, simple models at around $50 for light duty and DIY projects, as well as high-end professional models that cost above $300 for heavy duty projects. As earlier mentioned, in regards to power source, there’re two main types of jigsaws; Battery operated/cordless and Mains operated/corded. We will offer the best from the two worlds while going deeper to explain what each models’ power rating can achieve. Important features and functionalities we considered across our top selections of Jigsaws include blade factors, handle style, speed, dust blowers, and bevel capacity. We’ve considered user reviews and reviews from other experts so you only get high rated jigsaw models that have been proven to perform, high quality, reliable, durable and free from defects or design flaws. Here Are the: "Top 8 Jigsaws" You Can Find Today! On top of the below considerations, we also considered orbital functionality, motor type, accuracy, brand reputation, reliability, design, overall quality and with over 72 man-hours of researching, reviewing, consulting and fidgeting with a number of models. If you’re looking for a top-notch jigsaw for serious professional as well as home DIY projects, then the Festool Carvex PS 420 corded jigsaw will not disappoint. With this model, you get outstanding performance along with a sense of craftsmanship. The saw has an option to attach 4 special bases that allow efficiently handle different cutting projects. The base provided is excellent for most of the cutting tasks, but you can buy 4 more bases if you need to expand this model’s functionality. The phenolic resin base is low friction and slippery, best when working with plastic and wood. The dimpled base is a great choice when working with rough lumber, but if you’re working with metal, you might want to consider the still base. Lastly, there is the Velcro base which features felt-pad covers and allows you to work with pre-finished surfaces without scratching them. The saw also comes with a triple blade carbide guidance which offers both accuracy and safety. The Variable speed blade delivers up to an impressive maximum speed of 3800 SPM. This allows you to match the speed of the blade with the kind of material you’re working with for optimum results at all times. In addition to that, it has a neat splinter guard that ensures your material comes out tear-free even when working at full speed. The highly effective CT dust extraction system works hard at keeping your line of cut clear and your working environment clean. There is also a vacuum adapter under the handle which you can hook on the vacuum cleaner to keep your working area dust-free. The company also offers a 3-year full warranty which will give you total peace of mind with this tool. The tool also comes with a 30-day money back guarantee, a solid proof that the company stands behind there craftsmanship. In essence, you don’t have anything to lose. Overall, this tool comes backed with a solid, sturdy design and technology that will efficiently serve both beginners and professional woodworkers. The brushless motor makes this jigsaw lightweight and extremely durable. Quit pricy although the value is outstanding. The high-performance Bare-Tool Milwaukee 2645-20 cordless jigsaw boasts of the longest durability in its category. This model is tool-free and comes with shoe bevel with positive stops which will allow for quick shoe adjustments and increased accuracy. The beveling capacity allows for up to 45 degrees to the left and right with detents at 45, 30, 15, and 0 degrees. The 2645-20 has 5 orbital positions which offer much more cutting versatility than even some of the more expensive models. Whether you’re a beginner or have years of experience, you will be able to easily select the exact speed and type of cut that are more suited to your job requirements. With 5 orbital settings, you will be able to use your saw on wider applications compared to any other model in its category. And like most other models in its category, it features the handy quick-lock blade clamp that allows for easy and faster blade change. The unit is relatively lightweight, at 8 pounds, with its weight properly distributed. It feels quite solid in the hand and you won’t experience any blade-related bounce. Over-molded grip coupled with the variable speed trigger gives you ultimate control and a good sense of comfort when working with this model. 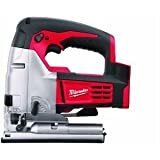 If you really need the freedom, flexibility, and convenience that comes with a cordless jigsaw without compromising on power, speed, cut quality and overall performance, the Milwaukee 2645-20 is probably your best bet. Bosch is a respected brand that offers a great mix of high-performance power tools at friendly prices, and the JS470E Corded model is no exception. 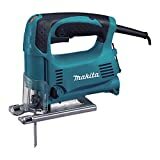 Equipped with a 7-amp motor, you can expect swift, clean cuts for small commercial or home carpentry projects. The 120-volt motor, 7-amp motor is powerful enough to handle most average projects. As long as you don’t expect to grunt on heavy duty projects day in day out, everything should be fine. With 4 orbital settings, you should be able to handle a wide range of cuts in all directions whether it’s quick and aggressive or slow and smooth. Bevel cutting capacity is at 45 degrees to the left and right. The jigsaw has a variable speed of between 500SPM to 3100SPM which is remarkable for a model in this price range. The trigger allows you to start off slowly, establish a cutting line and then gradually work the speed up. The Constant Response Circuitry ensures that the speed is consistent and well balanced. The maximum cutting capacity on Bosch JS470E is 5 7/8 inches for wood and 3/8 inch for steel. The lock-on button allows you to stay focused on the job and ease the strain on your trigger finger especially if you have a series of cuts to make. The blade changing mechanism requires no tools; simply eject the hot lade safely away from your fingers using an ejection lever in seconds. The adjustable dust blower is responsible for ensuring that no debris and sawdust is blown in your face or blocks the cut line. The purchase also comes with a blade, an overshoe, an anti-splinter insert, a bevel wrench and neat little carrying bag. You will also get a 1-year limited warranty from the manufacturer for added peace of mind. Tool-less blade changing capability with a quick blade eject mechanism. While the Makita 4329K might not last as long as some of the high-end models after prolonged, heavy use, this model performs way above expectations in its class. The variable speed corded jigsaw comes with a top-handle design and it’s constructed to feel as good and comfortable as it looks. The powerful 3.9-amp motor delivers variable speeds of between 500 and 3100SPM. This is quite powerful for even some of the most demanding commercial projects. The variable speeds also mean you can tweak it to suit various applications and materials you’re working with for more effective and efficient cutting without any tear-out or splintering. All you need is to fine-tune the speed dial. The comfortable rubberized grip on the top-handle means you can work for long hours with precision without feeling fatigued or strained. It weighs a mere 4.3 pounds and measures below 9 inches long, giving heavyweight performance without feeling burdened. Working with Makita 4329K is such a rewarding experience. There are very little vibration thanks to the innovating counterweight balancing system. The rubberized handle and big trigger switch are easy on your fingers too. There is also a dust port which you can connect to your standard vacuum cleaner. So this means your cutting line remains clear and the air around your workstation clean. You will also appreciate the 3 orbital settings that enable you to make a wide range of cuts in different directions. This capability is what sets apart the best jigsaw models and from the not so good ones. If you will be working with wood, you can expect a max cutting capacity of 2.6 inches at 90 degrees. The die-cast aluminum base is durable, rugged, extremely light, and allow you to adjust bevel cutting from 0 to 45 degrees to the left and to the right. There is also an onboard hex wrench that will allow you to change your blade or make bevel adjustments without a hassle. The company is also kind enough to provide a carrying case for when you need to store or move your tool to a different job site. Makita 4329K is definitely a wise choice for lightweight to medium DIY and professional cutting tasks. Ergonomic top-handle, rubberized grip design for increased control and comfort. 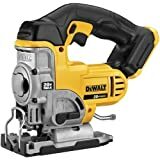 DeWalt is a highly reputable company that offers a wide range of power tools with an undisputable performance at consistently modest prices. The DCS311B cordless model is a reliable and remarkably versatile jigsaw that deserves a place in every woodworking shop. While most of the cordless models in the market offer convenience and freedom at the expense of power, as you will notice, this isn’t the case with the DeWalt DCS311B. With simple blade changing mechanism, remarkable orbital action and a dust blower for a clean working environment, this model is an excellent mid-range option for users looking for a high performing, affordable Jigsaw. It comes with freedom of maneuverability and movement that will allow you work even in the most cramped spots on your project. It’s however important to mention that this tool comes as a bare tool so you will need to purchase the DeWalt 20V battery and a charger. The saw comes with a variable motor with top speeds of up to 3000SPM. While this is not the fastest SPM rating, this speed is sufficient for any material. You will also get to tweak the SPM speeds to match you material and cutting applications. Having a dust blower also means that the menacing wood chips and sawdust particles will be kept out of your cutting line, your nose, eyes, and air in general. The Tool-free blade changing mechanism makes swapping blades easier which saves you plenty of effort and time. This saw accepts T-shank blades which are readily available. The model also allows you to easily adjust the orbital settings with 4 positions to select from. This allows you to make rapid and precise cuts in any direction with ease. Cutting bevels is also made easier with detents at 45 30, 15 and 0 degrees which make beveling a dream. Other than performance, comfort is also well taken care of on this model. It comes with an anti-slip handle which feels nice to hold and will enable you to work for a long session without feeling fatigued or dropping your tool. Additionally, it only weighs about 6 pounds meaning you won’t get fatigued even after long hours of cutting. Remarkable value for money with no sacrifice for performance. Has dust blower to keep your working environment dust free. The Makita DJV180Z is a reliable and lightweight cordless jigsaw that draws its power from capable 18 V lithium-ion batteries. This cordless model features tool-less blade changing mechanism and is available as a body only. The tool is double insulated and, facilitating a soft start that provides strong and smooth cutting at a speed of 2,600SPM. This upgraded model replaces the older BJV180Z, and most customers report that it has high performance with a solid, user-friendly design. This model has 3 orbital settings in addition to straight cutting backed by a powerful motor for cutting a wide range of materials. The variable speed dial allows you to tweak speeds from 0 to 2,600 strokes per minute depending of the material and application. You can also make bevel cuts up to 45 degrees right or left with a positive stop a 90-degree for solid and precise cutting performance. Makita also boosted durability on this particular model by using a Die cast base made of heavy-duty aluminum for extended tool life. It also has a large trigger switch that will not claw into your hand after long hours of use. The built-in LED lights ensure a clear line of sight, especially when working in cramped workspaces. The sawdust blowing feature also helps to keep debris out of your pencil line. After only 22 minutes of charge time thanks to the air-cooled Optimum Charging System, the Li-ion batteries promise up to 430% more run time compared to Ni-MH or Ni-Cad used in some competitor models. 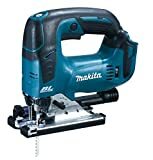 With a cutting depth of 5.3 inches in wood and 0.4 inches in steel, the Makita DJV180Z is a reasonable powerful cordless jigsaw that will handle your light to medium DIY and professional tasks without breaking a sweat. The PORTER-CABLE PCC650B cordless jigsaw is a powerful unit that draws its power from a 20-volt rechargeable lithium-ion battery. The unit is capable of delivering up to speeds of 2,500 SPM. With a variable speed trigger, you can accelerate from 0-2,500 SPM for accurate and clean cuts. The 3 orbital settings allow you to adjust the aggressiveness of your cut so you can tackle a wide range cutting of tasks. This model can switch to a bevel cutting action in seconds and provide a beveling capacity of 45 degrees to the left or right. There is also a beveling shoe that enables you to make quick adjustments for increased stability. Accuracy and comfort are also well taken care of. The built-in dust blower helps to keep your cutting line clear so you can make more precise cuts. It also comes with an over-molded handle grip which eliminates fatigue and improves control over your tool. For quick blade replacement action, there is a keyless, tool-free blade swapping system allows you to change the blades without breaking a stride. This tool accepts T-shank blades which means you can easily swap your woodcutting blade with a variety of other blades in the market to expand the capability of your saw. You will be able to cut metal, aluminum, pipe, countertops, laminate flooring, and plastic. The tool comes with one 4-inch cutting blade and a user manual. You will only need to buy the rechargeable 20VLithium Ion battery pack and you will be ready to roll. Most users have reported that the PORTER-CABLE PCC650B delivers precise, smooth cuts and offers power and speeds that rival pricier models. Doesn’t have speed control lock. This model is best suited for users looking for an extremely affordable and yet efficient jigsaw that can handle both DIY and professional projects. 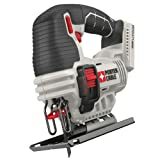 BLACK+DECKER Company is a power tool heavyweight that manufactures rugged and highly efficient power saws among at tools at an extremely modest price-point. This is one of the reasons why the Black+Decker BDEJS600C is the best selling jigsaw and Amazon’s favorite choice. This model features a 5-amp motor and an ability to make 45-degree bevel cuts, which is a performance above its category. So don’t let the cheap price trick you into thinking there is a compromise in performance. You have an option of buying it as a bare tool or, at a small additional cost, you can buy as a package which comes with extra blades. The cheaper option still comes with one blade allowing the tool to get down to work right out of the box. The capable 5-amp variable speed motor offers a maximum cutting speed of 3000SPM. This is enough for a wide range of common cutting tasks and also allows you to set an appropriate speed for different materials and applications. Being a corded model, you will need to have access to a 120 volts power outlet, but the power cable is long enough to afford you reasonable flexibility and freedom. The arched handle is quite comfortable and will allow you to work for extended sessions without blistering your hands. The control levers and buttons are all well accessible and the design feels solid and sturdy, unlike most other models at this price. This particular model comes with 4 orbital settings and a CurveControl both of which work together to make your cutting experience straightforward. You can make customized settings to the orbit to enable you to make complex cuts through tougher and more demanding materials. As earlier mentioned, the basic tool comes with a single blade, so if you need an additional blade, you might want to buy as a package or invest in separate blades. The model is compatible with the T and U shank blades and changing them is no hassle at all. It comes with a keyless blade clamp which allows you to swap the blades on demand without needing any tool. You will able be able to make accurate bevel cuts up to 45-degree angles in either direction which expands the range of applications this model can handle. To users who are on budget but still don’t want to compromise the quality of their work, this seems like a perfect option. The Curve control technology allows you to adjust the orbit with ease. Hassle-free, tool-free blade changing mechanism. Jigsaws are versatile power tools that any serious workshop cannot go without. As earlier explained, they have a variety of applications including cutting wood, plastic, ceramic tiles, aluminum, steel and a wide range of other materials. While their importance is indisputable, the challenge lies in choosing the best jigsaw that will give you the best performance, durability and better overall value for money. With the above reviews and recommendations, we hope to have minimized your challenge. The only remaining part now is to identify your cutting requirements and working conditions and match them with the most appropriate tool on the above list in regards to your budget. As always, we’ve tried to include different types across varying price ranges so you don’t miss something that clicks with your budget needs.